We all know them – the finicky eaters who won’t eat stuff that’s good for them. I once had a friend try to tell me that taking supplements would mean she could completely avoid eating any fruits and vegetables, (it doesn’t). But what do you do if you’re one of the finicky folks and you know you genuinely need to eat better, but you just don’t want to? First, know you’re not alone. Second, start with what you do like. When Rachel said she didn’t like vegetables, and only wanted to eat cheese, some meat, and bread, we sat down and figured out what she would be willing to eat. Try starting with the colors. 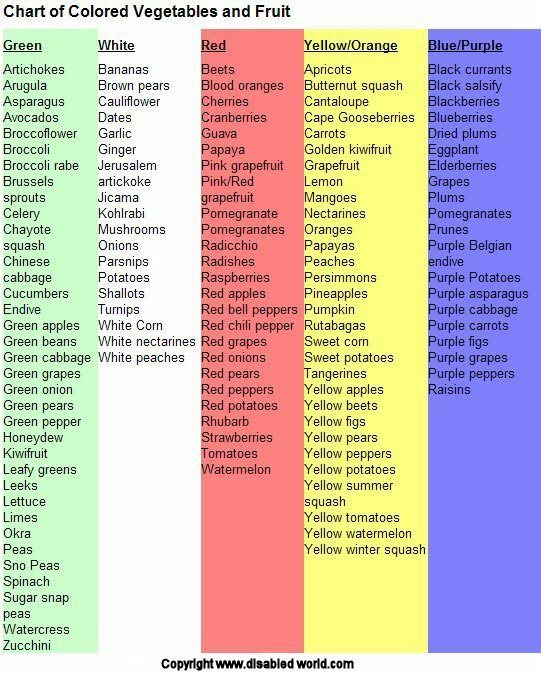 Experts recommend that we consume five colors of fruits and vegetables a day. Rachel gleefully pounced on that and said that cheese is orange. Yes, cheese IS orange. It is NOT, however, a fruit or a vegetable. Nice try. ~grin~ What are the colors? Circle everything on this list that you like or can tolerate. Then, focus on including those in your diet as much as possible. What about you, Dear Reader? What are your favorite fruits and vegetables? Next PostNext Tuesday with the Tauruses – Bin It!